Quantum entanglement is a physical phenomenon that occurs when pairs or groups of particles are generated, interact, or share spatial proximity in ways such that the quantum state of each particle cannot be described independently of the state of the others, even when the particles are separated by a large distance. Measurements of physical properties such as position, momentum, spin, and polarization, performed on entangled particles are found to be correlated. For example, if a pair of particles is generated in such a way that their total spin is known to be zero, and one particle is found to have clockwise spin on a certain axis, the spin of the other particle, measured on the same axis, will be found to be counterclockwise, as is to be expected due to their entanglement. However, this behavior gives rise to seemingly paradoxical effects: any measurement of a property of a particle performs an irreversible collapse on that particle and will change the original quantum state. In the case of entangled particles, such a measurement will be on the entangled system as a whole. Such phenomena were the subject of a 1935 paper by Albert Einstein, Boris Podolsky, and Nathan Rosen, and several papers by Erwin Schrödinger shortly thereafter, describing what came to be known as the EPR paradox. Einstein and others considered such behavior to be impossible, as it violated the local realism view of causality (Einstein referring to it as "spooky action at a distance") and argued that the accepted formulation of quantum mechanics must therefore be incomplete. Later, however, the counterintuitive predictions of quantum mechanics were verified experimentally in tests where the polarization or spin of entangled particles were measured at separate locations, statistically violating Bell's inequality. In earlier tests it couldn't be absolutely ruled out that the test result at one point could have been subtly transmitted to the remote point, affecting the outcome at the second location. However so-called "loophole-free" Bell tests have been performed in which the locations were separated such that communications at the speed of light would have taken longer—in one case 10,000 times longer—than the interval between the measurements. The counterintuitive predictions of quantum mechanics about strongly correlated systems were first discussed by Albert Einstein in 1935, in a joint paper with Boris Podolsky and Nathan Rosen. In this study, the three formulated the EPR paradox, a thought experiment that attempted to show that quantum mechanical theory was incomplete. They wrote: "We are thus forced to conclude that the quantum-mechanical description of physical reality given by wave functions is not complete." However, the three scientists did not coin the word entanglement, nor did they generalize the special properties of the state they considered. Following the EPR paper, Erwin Schrödinger wrote a letter to Einstein in German in which he used the word Verschränkung (translated by himself as entanglement) "to describe the correlations between two particles that interact and then separate, as in the EPR experiment." Schrödinger shortly thereafter published a seminal paper defining and discussing the notion of "entanglement." In the paper he recognized the importance of the concept, and stated: "I would not call [entanglement] one but rather the characteristic trait of quantum mechanics, the one that enforces its entire departure from classical lines of thought." The EPR paper generated significant interest among physicists which inspired much discussion about the foundations of quantum mechanics (perhaps most famously Bohm's interpretation of quantum mechanics), but produced relatively little other published work. So, despite the interest, the weak point in EPR's argument was not discovered until 1964, when John Stewart Bell proved that one of their key assumptions, the principle of locality, as applied to the kind of hidden variables interpretation hoped for by EPR, was mathematically inconsistent with the predictions of quantum theory. Specifically, Bell demonstrated an upper limit, seen in Bell's inequality, regarding the strength of correlations that can be produced in any theory obeying local realism, and he showed that quantum theory predicts violations of this limit for certain entangled systems. His inequality is experimentally testable, and there have been numerous relevant experiments, starting with the pioneering work of Stuart Freedman and John Clauser in 1972 and Alain Aspect's experiments in 1982, all of which have shown agreement with quantum mechanics rather than the principle of local realism. Until recently each had left open at least one loophole by which it was possible to question the validity of the results. However, in 2015 an experiment was performed that simultaneously closed both the detection and locality loopholes, and was heralded as "loophole-free"; this experiment ruled out a large class of local realism theories with certainty. Alain Aspect notes that the setting-independence loophole – which he refers to as "far-fetched", yet, a "residual loophole" that "cannot be ignored" – has yet to be closed, and the free-will / superdeterminism loophole is unclosable; saying "no experiment, as ideal as it is, can be said to be totally loophole-free." A minority opinion holds that although quantum mechanics is correct, there is no superluminal instantaneous action-at-a-distance between entangled particles once the particles are separated. Bell's work raised the possibility of using these super-strong correlations as a resource for communication. It led to the discovery of quantum key distribution protocols, most famously BB84 by Charles H. Bennett and Gilles Brassard and E91 by Artur Ekert. Although BB84 does not use entanglement, Ekert's protocol uses the violation of a Bell's inequality as a proof of security. In October 2018, physicists reported that quantum behavior can be explained with classical physics for a single particle, but not for multiple particles as in quantum entanglement and related nonlocality phenomena. An entangled system is defined to be one whose quantum state cannot be factored as a product of states of its local constituents; that is to say, they are not individual particles but are an inseparable whole. In entanglement, one constituent cannot be fully described without considering the other(s). Note that the state of a composite system is always expressible as a sum, or superposition, of products of states of local constituents; it is entangled if this sum necessarily has more than one term. Quantum systems can become entangled through various types of interactions. For some ways in which entanglement may be achieved for experimental purposes, see the section below on methods. Entanglement is broken when the entangled particles decohere through interaction with the environment; for example, when a measurement is made. The special property of entanglement can be better observed if we separate the said two particles. Let's put one of them in the White House in Washington and the other in Buckingham Palace (think about this as a thought experiment, not an actual one). Now, if we measure a particular characteristic of one of these particles (say, for example, spin), get a result, and then measure the other particle using the same criterion (spin along the same axis), we find that the result of the measurement of the second particle will match (in a complementary sense) the result of the measurement of the first particle, in that they will be opposite in their values. The above result may or may not be perceived as surprising. A classical system would display the same property, and a hidden variable theory (see below) would certainly be required to do so, based on conservation of angular momentum in classical and quantum mechanics alike. The difference is that a classical system has definite values for all the observables all along, while the quantum system does not. In a sense to be discussed below, the quantum system considered here seems to acquire a probability distribution for the outcome of a measurement of the spin along any axis of the other particle upon measurement of the first particle. This probability distribution is in general different from what it would be without measurement of the first particle. This may certainly be perceived as surprising in the case of spatially separated entangled particles. The paradox is that a measurement made on either of the particles apparently collapses the state of the entire entangled system—and does so instantaneously, before any information about the measurement result could have been communicated to the other particle (assuming that information cannot travel faster than light) and hence assured the "proper" outcome of the measurement of the other part of the entangled pair. In the Copenhagen interpretation, the result of a spin measurement on one of the particles is a collapse into a state in which each particle has a definite spin (either up or down) along the axis of measurement. The outcome is taken to be random, with each possibility having a probability of 50%. However, if both spins are measured along the same axis, they are found to be anti-correlated. This means that the random outcome of the measurement made on one particle seems to have been transmitted to the other, so that it can make the "right choice" when it too is measured. The distance and timing of the measurements can be chosen so as to make the interval between the two measurements spacelike, hence, any causal effect connecting the events would have to travel faster than light. According to the principles of special relativity, it is not possible for any information to travel between two such measuring events. It is not even possible to say which of the measurements came first. For two spacelike separated events x1 and x2 there are inertial frames in which x1 is first and others in which x2 is first. Therefore, the correlation between the two measurements cannot be explained as one measurement determining the other: different observers would disagree about the role of cause and effect. The hidden variables theory fails, however, when we consider measurements of the spin of entangled particles along different axes (for example, along any of three axes that make angles of 120 degrees). If a large number of pairs of such measurements are made (on a large number of pairs of entangled particles), then statistically, if the local realist or hidden variables view were correct, the results would always satisfy Bell's inequality. A number of experiments have shown in practice that Bell's inequality is not satisfied. However, prior to 2015, all of these had loophole problems that were considered the most important by the community of physicists. When measurements of the entangled particles are made in moving relativistic reference frames, in which each measurement (in its own relativistic time frame) occurs before the other, the measurement results remain correlated. The fundamental issue about measuring spin along different axes is that these measurements cannot have definite values at the same time―they are incompatible in the sense that these measurements' maximum simultaneous precision is constrained by the uncertainty principle. This is contrary to what is found in classical physics, where any number of properties can be measured simultaneously with arbitrary accuracy. It has been proven mathematically that compatible measurements cannot show Bell-inequality-violating correlations, and thus entanglement is a fundamentally non-classical phenomenon. 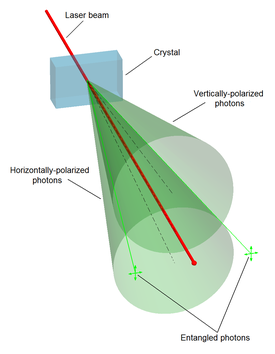 In experiments in 2012 and 2013, polarization correlation was created between photons that never coexisted in time. The authors claimed that this result was achieved by entanglement swapping between two pairs of entangled photons after measuring the polarization of one photon of the early pair, and that it proves that quantum non-locality applies not only to space but also to time. In three independent experiments in 2013 it was shown that classically-communicated separable quantum states can be used to carry entangled states. The first loophole-free Bell test was held in TU Delft in 2015 confirming the violation of Bell inequality. In August 2014, Brazilian researcher Gabriela Barreto Lemos and team were able to "take pictures" of objects using photons that had not interacted with the subjects, but were entangled with photons that did interact with such objects. Lemos, from the University of Vienna, is confident that this new quantum imaging technique could find application where low light imaging is imperative, in fields like biological or medical imaging. In 2015, Markus Greiner's group at Harvard performed a direct measurement of Renyi entanglement in a system of ultracold bosonic atoms. From 2016 various companies like IBM, Microsoft etc. have successfully created quantum computers and allowed developers and tech enthusiasts to openly experiment with concepts of quantum mechanics including quantum entanglement. There have been suggestions to look at the concept of time as an emergent phenomenon that is a side effect of quantum entanglement. In other words, time is an entanglement phenomenon, which places all equal clock readings (of correctly prepared clocks, or of any objects usable as clocks) into the same history. This was first fully theorized by Don Page and William Wootters in 1983. The Wheeler–DeWitt equation that combines general relativity and quantum mechanics – by leaving out time altogether – was introduced in the 1960s and it was taken up again in 1983, when the theorists Don Page and William Wootters made a solution based on the quantum phenomenon of entanglement. Page and Wootters argued that entanglement can be used to measure time. In 2013, at the Istituto Nazionale di Ricerca Metrologica (INRIM) in Turin, Italy, researchers performed the first experimental test of Page and Wootters' ideas. Their result has been interpreted to confirm that time is an emergent phenomenon for internal observers but absent for external observers of the universe just as the Wheeler-DeWitt equation predicts. Physicist Seth Lloyd says that quantum uncertainty gives rise to entanglement, the putative source of the arrow of time. According to Lloyd; "The arrow of time is an arrow of increasing correlations." The approach to entanglement would be from the perspective of the causal arrow of time, with the assumption that the cause of the measurement of one particle determines the effect of the result of the other particle's measurement. Based on AdS/CFT correspondence, Mark Van Raamsdonk suggested that spacetime arises as an emergent phenomenon of the quantum degrees of freedom that are entangled and live in the boundary of the space-time. Induced gravity can emerge from the entanglement first law. , but can always be described using local hidden variables. Moreover, it was shown that, for arbitrary numbers of parties, there exist states that are genuinely entangled but admit a local model. The mentioned proofs about the existence of local models assume that there is only one copy of the quantum state available at a time. If the parties are allowed to perform local measurements on many copies of such states, then many apparently local states (e.g., the qubit Werner states) can no longer be described by a local model. This is, in particular, true for all distillable states. However, it remains an open question whether all entangled states become non-local given sufficiently many copies. In short, entanglement of a state shared by two parties is necessary but not sufficient for that state to be non-local. It is important to recognize that entanglement is more commonly viewed as an algebraic concept, noted for being a prerequisite to non-locality as well as to quantum teleportation and to superdense coding, whereas non-locality is defined according to experimental statistics and is much more involved with the foundations and interpretations of quantum mechanics. States of the composite system that can be represented in this form are called separable states, or product states. If a state is inseparable, it is called an 'entangled state'. If the composite system is in this state, it is impossible to attribute to either system A or system B a definite pure state. Another way to say this is that while the von Neumann entropy of the whole state is zero (as it is for any pure state), the entropy of the subsystems is greater than zero. In this sense, the systems are "entangled". This has specific empirical ramifications for interferometry. It is worthwhile to note that the above example is one of four Bell states, which are (maximally) entangled pure states (pure states of the HA ⊗ HB space, but which cannot be separated into pure states of each HA and HB).
. When a mixed state has rank 1, it therefore describes a 'pure ensemble'. When there is less than total information about the state of a quantum system we need density matrices to represent the state. with spins aligned in the negative y direction. Generally, this is a mixed ensemble, as there can be any number of populations, each corresponding to a different state. , and the vectors are unit vectors. This is self-adjoint and positive and has trace 1.
are themselves pure ensembles. A state is then said to be entangled if it is not separable. In general, finding out whether or not a mixed state is entangled is considered difficult. The general bipartite case has been shown to be NP-hard. For the 2 × 2 and 2 × 3 cases, a necessary and sufficient criterion for separability is given by the famous Positive Partial Transpose (PPT) condition. ρA is sometimes called the reduced density matrix of ρ on subsystem A. Colloquially, we "trace out" system B to obtain the reduced density matrix on A. In general, a bipartite pure state ρ is entangled if and only if its reduced states are mixed rather than pure. Reduced density matrices were explicitly calculated in different spin chains with unique ground state. An example is the one-dimensional AKLT spin chain: the ground state can be divided into a block and an environment. The reduced density matrix of the block is proportional to a projector to a degenerate ground state of another Hamiltonian. In quantum information theory, entangled states are considered a 'resource', i.e., something costly to produce and that allows to implement valuable transformations. The setting in which this perspective is most evident is that of "distant labs", i.e., two quantum systems labeled "A" and "B" on each of which arbitrary quantum operations can be performed, but which do not interact with each other quantum mechanically. The only interaction allowed is the exchange of classical information, which combined with the most general local quantum operations gives rise to the class of operations called LOCC (local operations and classical communication). These operations do not allow the production of entangled states between the systems A and B. But if A and B are provided with a supply of entangled states, then these, together with LOCC operations can enable a larger class of transformations. For example, an interaction between a qubit of A and a qubit of B can be realized by first teleporting A's qubit to B, then letting it interact with B's qubit (which is now a LOCC operation, since both qubits are in B's lab) and then teleporting the qubit back to A. Note that two maximally entangled states of two qubits are used up in this process. Thus entangled states are a resource that enables the realization of quantum interactions (or of quantum channels) in a setting where only LOCC are available, but they are consumed in the process. There are other applications where entanglement can be seen as a resource, e.g., private communication or distinguishing quantum states. If two states can be transformed into each other by a local unitary operation, they are said to be in the same LU class. This is the finest of the usually considered classes. Two states in the same LU class have the same value for entanglement measures and the same value as a resource in the distant-labs setting. There is an infinite number of different LU classes (even in the simplest case of two qubits in a pure state). into a at least on pure entangled state. States that have this property are called distillable. These states are the most useful quantum states since, given enough of them, they can be transformed (with local operations) into any entangled state and hence allow for all possible uses. It came initially as a surprise that not all entangled states are distillable, those that are not are called 'bound entangled'. A different entanglement classification is based on what the quantum correlations present in a state allow A and B to do: one distinguishes three subsets of entangled states: (1) the non-local states, which produce correlations that cannot be explained by a local hidden variable model and thus violate a Bell inequality, (2) the steerable states that contain sufficient correlations for A to modify ("steer") by local measurements the conditional reduced state of B in such a way, that A can prove to B that the state they possess is indeed entangled, and finally (3) those entangled state that are neither non-local nor steerable. All three sets are non-empty. Entropy provides one tool that can be used to quantify entanglement, although other entanglement measures exist. If the overall system is pure, the entropy of one subsystem can be used to measure its degree of entanglement with the other subsystems. For mixed states, the reduced von Neumann entropy is not the only reasonable entanglement measure. Indeed, without this property, the von Neumann entropy would not be well-defined. where H is the Hamiltonian of the system. Here the entropy is unchanged. The reversibility of a process is associated with the resulting entropy change, i.e., a process is reversible if, and only if, it leaves the entropy of the system invariant. Therefore, the march of the arrow of time towards thermodynamic equilibrium is simply the growing spread of quantum entanglement. This provides a connection between quantum information theory and thermodynamics. 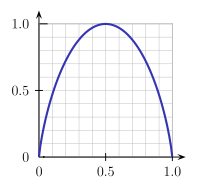 Rényi entropy also can be used as a measure of entanglement. Entanglement measures quantify the amount of entanglement in a (often viewed as a bipartite) quantum state. As aforementioned, entanglement entropy is the standard measure of entanglement for pure states (but no longer a measure of entanglement for mixed states). For mixed states, there are some entanglement measures in the literature and no single one is standard. Entanglement is used in some protocols of quantum cryptography. This is because the "shared noise" of entanglement makes for an excellent one-time pad. Moreover, since measurement of either member of an entangled pair destroys the entanglement they share, entanglement-based quantum cryptography allows the sender and receiver to more easily detect the presence of an interceptor. These four pure states are all maximally entangled (according to the entropy of entanglement) and form an orthonormal basis (linear algebra) of the Hilbert space of the two qubits. They play a fundamental role in Bell's theorem.
. GHZ states are occasionally extended to qudits, i.e., systems of d rather than 2 dimensions. Also for M>2 qubits, there are spin squeezed states. Spin squeezed states are a class of squeezed coherent states satisfying certain restrictions on the uncertainty of spin measurements, and are necessarily entangled. Spin squeezed states are good candidates for enhancing precision measurements using quantum entanglement. except the basis kets 0 and 1 have been replaced with "the N photons are in one mode" and "the N photons are in the other mode". Finally, there also exist twin Fock states for bosonic modes, which can be created by feeding a Fock state into two arms leading to a beam splitter. They are the sum of multiple of NOON states, and can used to achieve the Heisenberg limit. Entanglement is usually created by direct interactions between subatomic particles. These interactions can take numerous forms. One of the most commonly used methods is spontaneous parametric down-conversion to generate a pair of photons entangled in polarisation. Other methods include the use of a fiber coupler to confine and mix photons, photons emitted from decay cascade of the bi-exciton in a quantum dot, the use of the Hong–Ou–Mandel effect, etc., In the earliest tests of Bell's theorem, the entangled particles were generated using atomic cascades. It is also possible to create entanglement between quantum systems that never directly interacted, through the use of entanglement swapping. Two independently-prepared, identical particles may also be entangled if their wave functions merely spatially overlap, at least partially. probabilities. By definition, a state is entangled if it is not separable. For 2-Qubit and Qubit-Qutrit systems (2 × 2 and 2 × 3 respectively) the simple Peres–Horodecki criterion provides both a necessary and a sufficient criterion for separability, and thus -inadvertently- for detecting entanglement. However, for the general case, the criterion is merely a sufficient one for separability, as the problem becomes NP-hard when generalized. A numerical approach to the problem is suggested by Jon Magne Leinaas, Jan Myrheim and Eirik Ovrum in their paper "Geometrical aspects of entanglement". Leinaas et al. offer a numerical approach, iteratively refining an estimated separable state towards the target state to be tested, and checking if the target state can indeed be reached. An implementation of the algorithm (including a built-in Peres-Horodecki criterion testing) is "StateSeparator" web-app. In 2016 China launched the world’s first quantum communications satellite. The $100m Quantum Experiments at Space Scale (QUESS) mission was launched on Aug 16, 2016, from the Jiuquan Satellite Launch Center in northern China at 01:40 local time. For the next two years, the craft – nicknamed "Micius" after the ancient Chinese philosopher – will demonstrate the feasibility of quantum communication between Earth and space, and test quantum entanglement over unprecedented distances. In the June 16, 2017, issue of Science, Yin et al. report setting a new quantum entanglement distance record of 1,203 km, demonstrating the survival of a two-photon pair and a violation of a Bell inequality, reaching a CHSH valuation of 2.37 ± 0.09, under strict Einstein locality conditions, from the Micius satellite to bases in Lijian, Yunnan and Delingha, Quinhai, increasing the efficiency of transmission over prior fiberoptic experiments by an order of magnitude. The electron shell of multi-electron atoms always consists of entangled electrons. The correct ionization energy can be calculated only by consideration of electron entanglement. It has been suggested that in the process of photosynthesis, entanglement is involved in the transfer of energy between light-harvesting complexes and photosynthetic reaction centers where the kinetic energy is harvested in the form of chemical energy. Without such a process, the efficient conversion of optical energy into chemical energy cannot be explained. Using femtosecond spectroscopy, the coherence of entanglement in the Fenna-Matthews-Olson complex was measured over hundreds of femtoseconds (a relatively long time in this regard) providing support to this theory. In October 2018, physicists reported producing quantum entanglement using living organisms, particularly between living bacteria and quantized light. ^ a b Schrödinger E (1935). "Discussion of probability relations between separated systems". Mathematical Proceedings of the Cambridge Philosophical Society. 31 (4): 555–563. Bibcode:1935PCPS...31..555S. doi:10.1017/S0305004100013554. ^ Schrödinger E (1936). "Probability relations between separated systems". Mathematical Proceedings of the Cambridge Philosophical Society. 32 (3): 446–452. Bibcode:1936PCPS...32..446S. doi:10.1017/S0305004100019137. ^ Physicist John Bell depicts the Einstein camp in this debate in his article entitled "Bertlmann's socks and the nature of reality", p. 143 of Speakable and unspeakable in quantum mechanics: "For EPR that would be an unthinkable 'spooky action at a distance'. To avoid such action at a distance they have to attribute, to the space-time regions in question, real properties in advance of observation, correlated properties, which predetermine the outcomes of these particular observations. Since these real properties, fixed in advance of observation, are not contained in quantum formalism, that formalism for EPR is incomplete. It may be correct, as far as it goes, but the usual quantum formalism cannot be the whole story." And again on p. 144 Bell says: "Einstein had no difficulty accepting that affairs in different places could be correlated. What he could not accept was that an intervention at one place could influence, immediately, affairs at the other." Downloaded 5 July 2011 from Bell, J. S. (1987). Speakable and Unspeakable in Quantum Mechanics (PDF). CERN. ISBN 0521334950. Archived from the original (PDF) on 12 April 2015. Retrieved 14 June 2014. ^ "75 years of entanglement – Science News". 23 September 2013. Retrieved 13 October 2014. ^ Matson, John (13 August 2012). "Quantum teleportation achieved over record distances". Nature News. doi:10.1038/nature.2012.11163. ^ Yin, Juan; Cao, Yuan; Yong, Hai-Lin; Ren, Ji-Gang; Liang, Hao; Liao, Sheng-Kai; Zhou, Fei; Liu, Chang; Wu, Yu-Ping; Pan, Ge-Sheng; Li, Li; Liu, Nai-Le; Zhang, Qiang; Peng, Cheng-Zhi; Pan, Jian-Wei (2013). "Bounding the speed of 'spooky action at a distance". Physical Review Letters. 110 (26): 260407. arXiv:1303.0614. Bibcode:2013PhRvL.110z0407Y. doi:10.1103/PhysRevLett.110.260407. PMID 23848853. ^ Kwiat, PG; Mattle, K; Weinfurter, H; Zeilinger, A; Sergienko, AV; Shih, Y (1995). "New High-Intensity Source of Polarization-Entangled Photon Pairs". Physical Review Letters. 75 (24): 4337–4341. Bibcode:1995PhRvL..75.4337K. doi:10.1103/PhysRevLett.75.4337. PMID 10059884. ^ Zhao, Z; Chen, YA; Zhang, AN; Yang, T; Briegel, HJ; Pan, JW (July 2004). "Experimental demonstration of five-photon entanglement and open-destination teleportation". Nature. 430 (6995): 54–58. arXiv:quant-ph/0402096. Bibcode:2004Natur.430...54Z. doi:10.1038/nature02643. PMID 15229594. ^ Lu, Chao-Yang (2007). "Experimental entanglement of six photons in graph states". Nature Physics. 3 (2): 91–95. arXiv:quant-ph/0609130. Bibcode:2007NatPh...3...91L. doi:10.1038/nphys507. ^ Yao, Xing-Can (2012). "Observation of eight-photon entanglement". Nature Photonics. 6 (4): 225–228. arXiv:1105.6318. Bibcode:2012NaPho...6..225Y. doi:10.1038/nphoton.2011.354. ^ J. A. Formaggio, D. I. Kaiser, M. M. Murskyj, and T. E. Weiss (2016), "Violation of the Leggett-Garg inequality in neutrino oscillations". Phys. Rev. Lett. Accepted 23 June 2016. ^ Hensen, B.; et al. (21 October 2015). "Loophole-free Bell inequality violation using electron spins separated by 1.3 kilometres". Nature. 526 (7575): 682–686. arXiv:1508.05949. Bibcode:2015Natur.526..682H. doi:10.1038/nature15759. PMID 26503041. Retrieved 21 October 2015. See also free online access version. ^ Markoff, Jack (21 October 2015). "Sorry, Einstein. Quantum Study Suggests 'Spooky Action' Is Real". The New York Times. Retrieved 21 October 2015. ^ Lee, K. C.; Sprague, M. R.; Sussman, B. J.; Nunn, J.; Langford, N. K.; Jin, X.- M.; Champion, T.; Michelberger, P.; Reim, K. F.; England, D.; Jaksch, D.; Walmsley, I. A. (2 December 2011). "Entangling macroscopic diamonds at room temperature". Science. 334 (6060): 1253–1256. Bibcode:2011Sci...334.1253L. doi:10.1126/science.1211914. PMID 22144620. Lay summary. ^ Kumar, M., Quantum, Icon Books, 2009, p. 313. ^ J. S. Bell (1964). "On the Einstein-Poldolsky-Rosen paradox". Physics. ^ Freedman, Stuart J.; Clauser, John F. (1972). "Experimental Test of Local Hidden-Variable Theories". Physical Review Letters. 28 (14): 938–941. Bibcode:1972PhRvL..28..938F. doi:10.1103/PhysRevLett.28.938. ^ A. Aspect; P. Grangier & G. Roger (1982). "Experimental Realization of Einstein-Podolsky-Rosen-Bohm Gedankenexperiment: A New Violation of Bell's Inequalities". Physical Review Letters. 49 (2): 91–94. Bibcode:1982PhRvL..49...91A. doi:10.1103/PhysRevLett.49.91. ^ Hanson, Ronald (2015). "Loophole-free Bell inequality violation using electron spins separated by 1.3 kilometres". Nature. 526 (7575): 682–686. arXiv:1508.05949. Bibcode:2015Natur.526..682H. doi:10.1038/nature15759. PMID 26503041. ^ Aspect, Alain (16 December 2015). "Viewpoint: Closing the Door on Einstein and Bohr's Quantum Debate". Physics. 8. ^ Sanctuary, B. C (2006). "Correlations in Entangled States". International Journal of Modern Physics B. 20 (11n13): 1496–1503. arXiv:quant-ph/0508238. doi:10.1142/S0217979206034078. ^ Yin, Juan; Cao, Yuan; Yong, Hai-Lin; Ren, Ji-Gang; Liang, Hao; Liao, Sheng-Kai; Zhou, Fei; Liu, Chang; Wu, Yu-Ping; Pan, Ge-Sheng; Zhang, Qiang; Peng, Cheng-Zhi; Pan, Jian-Wei (2004). "The Statistical Interpretation of Entangled States". arXiv:quant-ph/0404011. ^ Khrennikov, Andrei (2016). "After Bell". Fortschritte der Physik. 65 (6–8): 1600044. doi:10.1002/prop.201600044. ^ Yin, Juan; Cao, Yuan; Yong, Hai-Lin; Ren, Ji-Gang; Liang, Hao; Liao, Sheng-Kai; Zhou, Fei; Liu, Chang; Wu, Yu-Ping; Pan, Ge-Sheng; Zhang, Qiang; Peng, Cheng-Zhi; Pan, Jian-Wei (2016). "After Bell". Fortschritte der Physik (Progress in Physics)} (2017). 65 (1600014): 6–8. arXiv:1603.08674. ^ Yin, Juan; Cao, Yuan; Yong, Hai-Lin; Ren, Ji-Gang; Liang, Hao; Liao, Sheng-Kai; Zhou, Fei; Liu, Chang; Wu, Yu-Ping; Pan, Ge-Sheng; Zhang, Qiang; Peng, Cheng-Zhi; Pan, Jian-Wei (2007). "Classical statistical distributions can violate Bell-type inequalities". Journal of Physics A: Mathematical and Theoretical. 41 (8): 085303. arXiv:quant-ph/0703251. doi:10.1088/1751-8113/41/8/085303. ^ Ekert, A.K. (1991). "Quantum cryptography based on Bell's theorem". Phys. Rev. Lett. 67 (6): 661–663. Bibcode:1991PhRvL..67..661E. doi:10.1103/PhysRevLett.67.661. ISSN 0031-9007. PMID 10044956. ^ Staff (11 October 2018). "Public Release: 11-OCT-2018 - Where is it, the foundation of quantum reality?". EurekAlert!. Retrieved 13 October 2018. ^ Blasiak, Pawel (13 July 2018). "Local model of a qudit: Single particle in optical circuits". Physical Review. 98 (012118) (1). doi:10.1103/PhysRevA.98.012118. Retrieved 13 October 2018. ^ Asher Peres, Quantum Theory, Concepts and Methods, Kluwer, 1993; ISBN 0-7923-2549-4 p. 115. ^ Rupert W., Anderson (28 March 2015). The Cosmic Compendium: Interstellar Travel (First ed.). The Cosmic Compendium. p. 100. ISBN 9781329022027. ^ magazine, Elizabeth Gibney, Nature. "Cosmic Test Bolsters Einstein's "Spooky Action at a Distance"". Scientific American. Retrieved 4 February 2017. ^ Santos, E (2004). "The failure to perform a loophole-free test of Bell's Inequality supports local realism". Foundations of Physics. 34 (11): 1643–1673. Bibcode:2004FoPh...34.1643S. doi:10.1007/s10701-004-1308-z. ^ H. Zbinden; et al. (2001). "Experimental test of nonlocal quantum correlations in relativistic configurations". Phys. Rev. A. 63 (2): 22111. arXiv:quant-ph/0007009. Bibcode:2001PhRvA..63b2111Z. doi:10.1103/PhysRevA.63.022111. ^ Some of the history of both referenced Zbinden, et al. experiments is provided in Gilder, L., The Age of Entanglement, Vintage Books, 2008, pp. 321–324. ^ Cirel'son, B. S. (1980). "Quantum generalizations of Bell's inequality". Letters in Mathematical Physics. 4 (2): 93–100. Bibcode:1980LMaPh...4...93C. doi:10.1007/BF00417500. ^ Megidish, E.; Halevy, A.; Shacham, T.; Dvir, T.; Dovrat, L.; Eisenberg, H. S. (2013). "Entanglement Swapping between Photons that have Never Coexisted". Physical Review Letters. 110 (21): 210403. arXiv:1209.4191. Bibcode:2013PhRvL.110u0403M. doi:10.1103/physrevlett.110.210403. PMID 23745845. ^ "Classical carrier could create entanglement". physicsworld.com. 11 December 2013. Retrieved 14 June 2014. ^ "Loophole-free Bell test | Ronald Hanson". ^ Gibney, Elizabeth (2014). "Entangled photons make a picture from a paradox". Nature. doi:10.1038/nature.2014.15781. Retrieved 13 October 2014. ^ Rozatkar, Gaurav (16 August 2018). "Demonstration of quantum entanglement". OSF. ^ Moreva, Ekaterina (2014). "Time from quantum entanglement: an experimental illustration". Physical Review A. 89 (5): 052122. arXiv:1310.4691. Bibcode:2014PhRvA..89e2122M. doi:10.1103/PhysRevA.89.052122. ^ "Entangled toy universe shows time may be an illusion". Retrieved 13 October 2014. ^ a b "Quantum Experiment Shows How Time 'Emerges' from Entanglement". Medium. 23 October 2013. Retrieved 13 October 2014. ^ "New Quantum Theory Could Explain the Flow of Time". Wired. 25 April 2014. Retrieved 13 October 2014. ^ Van Raamsdonk, Mark (19 June 2010). "Building up spacetime with quantum entanglement". General Relativity and Gravitation. 42 (10): 2323–2329. arXiv:1005.3035. doi:10.1007/s10714-010-1034-0. ISSN 0001-7701. ^ Lee, Jae-Weon; Kim, Hyeong-Chan; Lee, Jungjai (2013). "Gravity from quantum information". Journal of the Korean Physical Society. 63 (5): 1094–1098. arXiv:1001.5445. doi:10.3938/jkps.63.1094. ISSN 0374-4884. ^ Swingle, Brian; Van Raamsdonk, Mark (12 May 2014). "Universality of Gravity from Entanglement". arXiv:1405.2933 [hep-th]. ^ Nicolas Brunner; Daniel Cavalcanti; Stefano Pironio; Valerio Scarani; Stephanie Wehner (2014). "Bell nonlocality". Rev. Mod. Phys. 86 (2): 419–478. arXiv:1303.2849. doi:10.1103/RevModPhys.86.419. ^ Werner, R.F. (1989). "Quantum States with Einstein-Podolsky-Rosen correlations admitting a hidden-variable model". Physical Review A. 40 (8): 4277–4281. Bibcode:1989PhRvA..40.4277W. doi:10.1103/PhysRevA.40.4277. PMID 9902666. ^ In the literature "non-locality" is sometimes used to characterize concepts that differ from the non-existence of a local hidden variable model, e.g., whether states can be distinguished by local measurements and which can occur also for non-entangled states (see, e.g., Charles H. Bennett, David P. DiVincenzo, Christopher A. Fuchs, Tal Mor, Eric Rains, Peter W. Shor, John A. Smolin, and William K. Wootters (1999). "Quantum nonlocality without entanglement". Phys. Rev. A. 59 (2): 1070–1091. arXiv:quant-ph/9804053. doi:10.1103/PhysRevA.59.1070. CS1 maint: Uses authors parameter (link)). This non-standard use of the term is not discussed here. ^ Nielsen, Michael A.; Chuang, Isaac L. (2000). Quantum Computation and Quantum Information. Cambridge University Press. pp. 112–113. ISBN 978-0-521-63503-5. ^ Gurvits L (2003). Classical deterministic complexity of Edmonds' Problem and quantum entanglement. Proceedings of the Thirty-fifth Annual ACM Symposium on Theory of Computing. p. 10. arXiv:quant-ph/0303055. doi:10.1145/780542.780545. ISBN 978-1-58113-674-6. ^ Dirac, P. A. M. (2008). "Note on Exchange Phenomena in the Thomas Atom" (PDF). Mathematical Proceedings of the Cambridge Philosophical Society. 26 (3): 376. Bibcode:1930PCPS...26..376D. doi:10.1017/S0305004100016108. ^ Fan, H; Korepin V; Roychowdhury V (2004). "Entanglement in a Valence-Bond Solid State". Physical Review Letters. 93 (22): 227203. arXiv:quant-ph/0406067. Bibcode:2004PhRvL..93v7203F. doi:10.1103/PhysRevLett.93.227203. PMID 15601113. ^ Franchini, F.; Its, A. R.; Korepin, V. E.; Takhtajan, L. A. (2010). "Spectrum of the density matrix of a large block of spins of the XY model in one dimension". Quantum Information Processing. 10 (3): 325–341. arXiv:1002.2931. doi:10.1007/s11128-010-0197-7. ^ B. Kraus (2010). "Local unitary equivalence of multipartite pure states". Phys. Rev. Lett. 104 (2): 020504. arXiv:0909.5152. doi:10.1103/PhysRevLett.104.020504. PMID 20366579. ^ M. A. Nielsen (1999). "Conditions for a Class of Entanglement Transformations". Phys. Rev. Lett. 83 (2): 436. arXiv:quant-ph/9811053. doi:10.1103/PhysRevLett.83.436. ^ Cerf, Nicolas J.; Cleve, Richard. "Information-theoretic interpretation of quantum error-correcting codes" (PDF). ^ a b Plenio; Virmani (2007). "An introduction to entanglement measures". Quant. Inf. Comp. 1: 1–51. arXiv:quant-ph/0504163. Bibcode:2005quant.ph..4163P. ^ Wolchover, Natalie (25 April 2014). "New Quantum Theory Could Explain the Flow of Time". www.wired.com. Quanta Magazine. Retrieved 27 April 2014. ^ Huang, Yichen (21 March 2014). "Computing quantum discord is NP-complete". New Journal of Physics. 16 (3): 033027. arXiv:1305.5941. Bibcode:2014NJPh...16c3027H. doi:10.1088/1367-2630/16/3/033027. ^ Bouwmeester, Dik; Pan, Jian-Wei; Mattle, Klaus; Eibl, Manfred; Weinfurter, Harald & Zeilinger, Anton (1997). "Experimental Quantum Teleportation" (PDF). Nature. 390 (6660): 575–579. Bibcode:1997Natur.390..575B. doi:10.1038/37539. ^ Richard Jozsa; Noah Linden (2002). "On the role of entanglement in quantum computational speed-up". Proceedings of the Royal Society A: Mathematical, Physical and Engineering Sciences. 459 (2036): 2011–2032. arXiv:quant-ph/0201143. Bibcode:2003RSPSA.459.2011J. CiteSeerX 10.1.1.251.7637. doi:10.1098/rspa.2002.1097. ^ Ekert, Artur K. (1991). "Quantum cryptography based on Bell's theorem". Physical Review Letters. 67 (6): 661–663. Bibcode:1991PhRvL..67..661E. doi:10.1103/PhysRevLett.67.661. PMID 10044956. ^ Yin, Juan; Cao, Yuan; Yong, Hai-Lin; Ren, Ji-Gang; Liang, Hao; Liao, Sheng-Kai; Zhou, Fei; Liu, Chang; Wu, Yu-Ping; Pan, Ge-Sheng; Zhang, Qiang; Peng, Cheng-Zhi; Pan, Jian-Wei (2010). "Contextuality offers device-independent security". arXiv:1006.0468 [quant-ph]. ^ Pezze, Luca & Smerzi, Augusto (2009). "Entanglement, Nonlinear Dynamics, and the Heisenberg Limit". Phys. Rev. Lett. 102 (10): 100401. arXiv:0711.4840. Bibcode:2009PhRvL.102j0401P. doi:10.1103/PhysRevLett.102.100401. PMID 19392092. ^ Kitagawa, Masahiro; Ueda, Masahito (1993). "Squeezed Spin States". Phys. Rev. A. 47 (6): 5138–5143. Bibcode:1993PhRvA..47.5138K. doi:10.1103/physreva.47.5138. PMID 9909547. ^ Wineland, D. J.; Bollinger, J. J.; Itano, W. M.; Moore, F. L.; Heinzen, D. J. (1992). "Spin squeezing and reduced quantum noise in spectroscopy". Phys. Rev. A. 46 (11): R6797–R6800. Bibcode:1992PhRvA..46.6797W. doi:10.1103/PhysRevA.46.R6797. PMID 9908086. ^ Holland, M. J; Burnett, K (1993). "Interferometric detection of optical phase shifts at the Heisenberg limit". Physical Review Letters. 71 (9): 1355–1358. doi:10.1103/PhysRevLett.71.1355. PMID 10055519. ^ Akopian, N. (2006). "Entangled Photon Pairs from Semiconductor Quantum Dots". Phys. Rev. Lett. 96 (2): 130501. arXiv:quant-ph/0509060. Bibcode:2006PhRvL..96b0501D. doi:10.1103/PhysRevLett.96.020501. PMID 16486553. ^ Rosario Lo Franco and Giuseppe Compagno, "Indistinguishability of Elementary Systems as a Resource for Quantum Information Processing", Phys. Rev. Lett. 120, 240403, 14 June 2018. ^ Gurvits, L., Classical deterministic complexity of Edmonds' problem and quantum entanglement, in Proceedings of the 35th ACM Symposium on Theory of Computing, ACM Press, New York, 2003. ^ Sevag Gharibian, Strong NP-Hardness of the Quantum Separability Problem, Quantum Information and what's known as Quantum Computing, Vol. 10, No. 3&4, pp. 343–360, 2010. arXiv:0810.4507. ^ "China's quantum satellite achieves 'spooky action' at record distance". 14 June 2017. ^ Frank Jensen: Introduction to Computational Chemistry. Wiley, 2007, ISBN 978-0-470-01187-4. ^ Berkeley Lab Press Release: Untangling the Quantum Entanglement Behind Photosynthesis: Berkeley scientists shine new light on green plant secrets. ^ Marletto, c.; Coles, D.M. ; Farrow, T.; Vedral, V. (10 October 2018). "Entanglement between living bacteria and quantized light witnessed by Rabi splitting". Journal of Physics Communications. 2 (10). Retrieved 29 October 2018. ^ O'allaghan, Jonathan (29 October 2018). ""Schrödinger's Bacterium" Could Be a Quantum Biology Milestone - A recent experiment may have placed living organisms in a state of quantum entanglement". Scientific American. Retrieved 29 October 2018. Gühne, O.; Tóth, G. (2009). "Entanglement detection". Physics Reports. 474 (1–6): 1–75. arXiv:0811.2803. Bibcode:2009PhR...474....1G. doi:10.1016/j.physrep.2009.02.004. Jaeger G (2009). Entanglement, Information, and the Interpretation of Quantum Mechanics. Heildelberg: Springer. ISBN 978-3-540-92127-1. Plenio MB, Virmani S; Virmani (2007). "An introduction to entanglement measures". Quant. Inf. Comp. 1 (7): 1–51. arXiv:quant-ph/0504163. Bibcode:2005quant.ph..4163P. Steward EG (2008). Quantum Mechanics: Its Early Development and the Road to Entanglement. Imperial College Press. ISBN 978-1-86094-978-4. Vedral, V. (2002). "The role of relative entropy in quantum information theory". Reviews of Modern Physics. 74 (1): 197–234. arXiv:quant-ph/0102094. Bibcode:2002RvMP...74..197V. doi:10.1103/RevModPhys.74.197.